This station is one of many that existed along the Rochester, Lockport & Buffalo Railway, which operated fast electric trains between its namesake cities from 1908 until its abandonment in 1931. 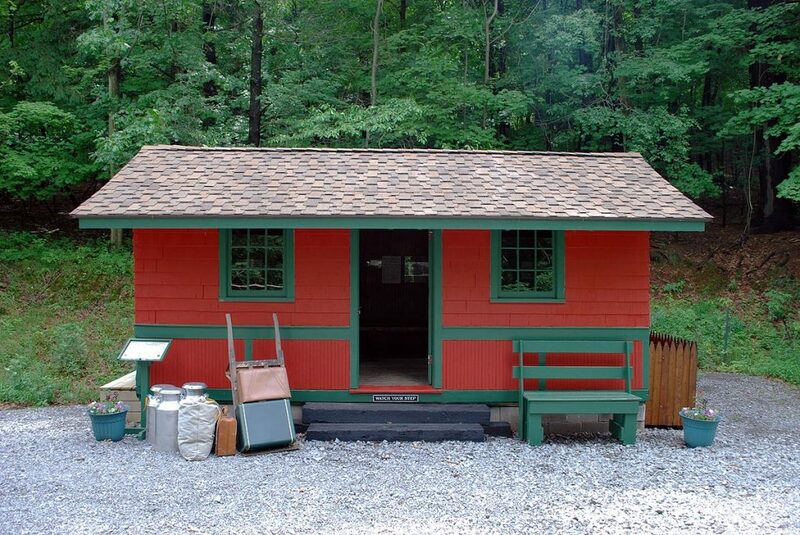 Unmanned shelters such as these were provided at intermediate station stops along the way. In larger cities, RL&B stations were built into existing downtown storefronts or even parts of large private homes. Originally named the Buffalo, Lockport & Rochester Railway, this line was originally planned to be a high-speed route between Rochester and Toronto, and was built to the highest standards of the time to allow for heavy, frequent trains. While the connection to Toronto was never built, the majority of construction was completed 1909, largely parallel to the New York Central’s Falls Road division as far as Lockport. In 1911, the line was sold to Clifford Beebe, who also controlled interurban lines connecting Rochester and Syracuse. In 1919, the line was acquired by local Rochester interests and renamed the Rochester, Lockport & Buffalo Railway. Starting in 1928, RL&B trains were routed into the Rochester Subway at Lyell Avenue and terminated at City Hall station. All passenger service on the RL&B ended when the line was abandoned on April 30, 1931. We believe this station came from Spencerport. More than likely, this station was constructed around 1908 when the RL&B was established. After the end of train service in 1931, this building was purchased by a local farmer where it was used as a children’s playhouse. Fortunately, it remained in good condition and largely unaltered until our museum purchased the structure at auction in 1995. Upon its arrival at our museum, volunteers took important steps towards stabilizing and preserving the historic trolley stop. It was placed onto a sturdy steel frame with wheels attached so it could be relocated like a trailer to different parts of our museum campus. Initially, the building was painted brown with cream trim, our best guess based on information available at the time. On display in our yard at Industry for many years, in 2009 we moved the shelter to the end of our line, naming the location “Midway.” In 2013, the station was repainted dark red with dark green trim, which we believe is a more accurate representation of how this building would have appeared when it was in service on the RL&B. Midway Station is currently only used for special events, and is not open to the public.